William Rockhill Nelson (March 7, 1841 – April 13, 1915) was a real estate developer and co-founder of The Kansas City Star in Kansas City, Missouri. 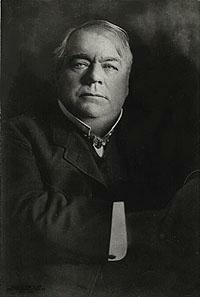 He donated his estate (and home) for the establishment of the Nelson-Atkins Museum of Art. He was born in Fort Wayne, Indiana. His father was Isaac De Groff Nelson (1810–1891) and his mother was Elizabeth Rockhill (1816–1889), the daughter of William R. Rockhill (1793–1865), an important farmer and politician in Fort Wayne, Indiana. For a short time, Isaac Nelson owned The Sentinel newspaper, which became the (Fort Wayne News Sentinel). But I.D.G. Nelson, as he was fondly known for many years in Fort Wayne, was much more renowned as a nursery owner. His own estate, “Elm Park” was considered "the showplace of Allen County." Nelson, as a 15-year-old attended the University of Notre Dame (which accepted high school students) at the time for two years which he described as "Botany Bay for bad boys." Notre Dame was reported to have asked that he not return. Not that he was ever a colonel of anything...He was just coloneliferous. Nelson along formally took over the Sentinel with Samuel Morss in 1879. In 1880 they moved to Kansas City and started the Star. At the time there were three daily competitors – the Evening Mail; The Kansas City Times; and the Kansas City Journal. Nelson took over sole ownership of the paper within a few months. He purchased the Kansas City Evening Mail and its Associated Press franchise in 1882 and started the Weekly Kansas City Star in 1890 and the Sunday Kansas City Star in 1894. Nelson had portraits of Tilden, Grover Cleveland, and Theodore Roosevelt in his office and was a crusading editor. Roosevelt was to stay with Nelson at Oak Hall. Among his most famous crusades was a push for Kansas City’s George Kessler-designed park and boulevard system and the 1900 “Kansas City Spirit” to build Convention Hall in 90 days in order to host the 1900 Democratic National Convention after the original (and new) convention hall had burned in April 1900. Nelson bought the Times in 1901 putting “The Morning Kansas City Star” on it. From the bulbous torso, with its fawn-colored vest, black coat and short thick arms, a collar suddenly expanded. It was like no other collar ever made; it widened from the neckband to take in a steadily heavier neck, and almost triple chin, and folds which rolled down at the base of his skull. His face was square, his mouth a wide, firm indenture; his chin overcame those folds beneath and jutted like Vermont granite. His nose began abruptly and ended the same way. Shaggy penthouses ruled over eyes which were really threatened by blindness, but which seemed to possess second-sight. His white hair was always rumpled, as if by pawing slaps from his fat hands. He had trouble getting into a chair and out of it. He would ask for something only once. Then he bellowed. In addition to his newspaper duties, Nelson developed an area of farmland south of downtown Kansas City into a neighborhood of more than 100 houses, including his own mansion called Oak Hall. The area, which became known as the Rockhill District, was noted for its use of limestone in both the houses  and in stone walls that stood beside the streets  Nelson also acquired more than 2,400 acres (9.7 km2) in what is presently Grain Valley, Missouri, for the establishment of Sni A Bar Farm. The farm's mission was the development of improved breeding methods and livestock. It served as one of the world's leaders in animal health for more than 30 years. Nelson provided in his will that following the death of his wife and daughter his Oak Hill mansion be torn down and its 30-acre (120,000 m2) estate turned into an art museum. Proceeds from his $6 million estate were used to build the Nelson-Atkins Museum of Art in Kansas City. Nelson's will also established a trust for Sni A Bar Farm, with Presidents from the University of Missouri, the University of Kansas, and the University of Oklahoma charged with selecting its trustees. The Art Gallery originally contained a recreation of Nelson's oak paneled room from Oak Hall (and namesake of the estate). The room contained Nelson's red plush easy chair and bookcases. The room was dismantled in 1988 to make way for a photography studio. His memorial is located in a mausoleum located at Mount Washington Cemetery in Independence, Missouri, between Truman Road and US Route 24. This page was last edited on 19 November 2018, at 11:56 (UTC).